Earlier this year, I finally made the visit to the Raffles Museum (Raffles Museum of Biodiversity Research, RMBR for short). I was alittle apprehensive at first, knowing there would be dead specimens of creepy crawlies like spiders, which I absolutely, put it in a mild way - dislike. Apart from my other fear of heights (Neil can attest to that! ), arachnids would be my other kryptonite. I would cringe at the sight of leggy fellows, especially big ones. Although I didn't really have any 'intimate' encounters with big spiders during explorations, always stayed a wide berth from them. Small ones are still ok for me though. Usually I would break out in cold sweat, and laugh bout it later on. On a past occasion while exploring and taking photos near the Kranji dam, noticing a tree which seemed hollow, decided to duck under it's foliage to take a look. To my horror, in the trees were numerous large Golden Orb Web Spiders, wait... numerous would be an understatement. There were at least thirty of them big spiders hanging just metres above my head, slowly and hastily I made a getaway from my half squat position after taking a photo (Pity, I couldn't find that photo now and scan it, was shot during the film days on my FE10). I couldn't imagine if any of them decided to fall off their web, land on me and give me a nasty bite. Delirious. This is small, the ones under that tree had bodies palm sized! Enough bout spiders, so how did I came to know about Raffles Museum? I did not know the existence of such a place prior 2007 if I could remember. With my initial exploration visits to document the war time outpost on the hill slope in 2007 (which I visited again with the group in 2011! ), while researching and reading up on the group that does the WW2 commemorative walks. And through a friend, who calls herself MicaMonkey, I came to know the group - The Toddycats. About the name – Toddycats! are volunteers with the Raffles Museum of Biodiversity Research at the National University of Singapore. The name comes from the Common Palm Civet (Paradoxurus hermaphroditus), the last wild carnivore that survives in urbanised Singapore. The logo of the Raffles Museum is a toddy cat on a palm leaf and the significance of this is explained here. 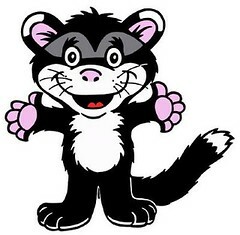 The original toddycat drawing on the museum logo was based on an abandoned civet kitten that was rescued from ants at an army camp and brought in to the then Department of Zoology in 1996. A few of us cared for the animal and gave this civet the name “Toddy”. Tragically he was killed by a dog. What about the Raffles Museum? Many generations of Singaporeans will remember some of the landmark exhibits in the Raffles Museum viz the suspended 12.8 metre skeleton of the baleen whale that was beached at Malacca in 1892, the butterfly and bird displays and the imposing skeleton of the elephant that was shot by the Sultan of Johor in 1909. The article contains the historical info of Raffles Museum is clearly written and that includes the valued personal insights of Professor Leo Tan of NUS. So I shan't explain more on the history of Raffles Museum, don't wish any indignity of rehashing information via haphazard 'cut & paste' jobs. Big bat, it's size of a small dog minus the wingspan!! Dangerous fishes in Singapore waters, check out the Stonefish! Honestly, my photos alone doesn't do Raffles Museum justice, one simply has to visit them personally. Go through each and every exhibit, squirm and feel uncomfortable if you have to. Read up on the descriptions and marvel at the actual (dead) specimens. I was glad I made the visit, I admit, I didn't know some of the species were native! Some education! What are you waiting for, go visit the Raffles Museum today! For more instructions on how to get there.